First hurrah! Not all aid works; so we should measure & manage performance better. I’d just extend the question to: which aid works in which circumstances? We know blueprint approaches don’t work. So we need to consider local politics, causality and the view from the bottom up. More focus on management and participation, less on randomised control trials. Hurrah again! Get this straight, and we can focus on measuring the right thing, which is: how much value are we adding – not did we solve all the problems of poverty. 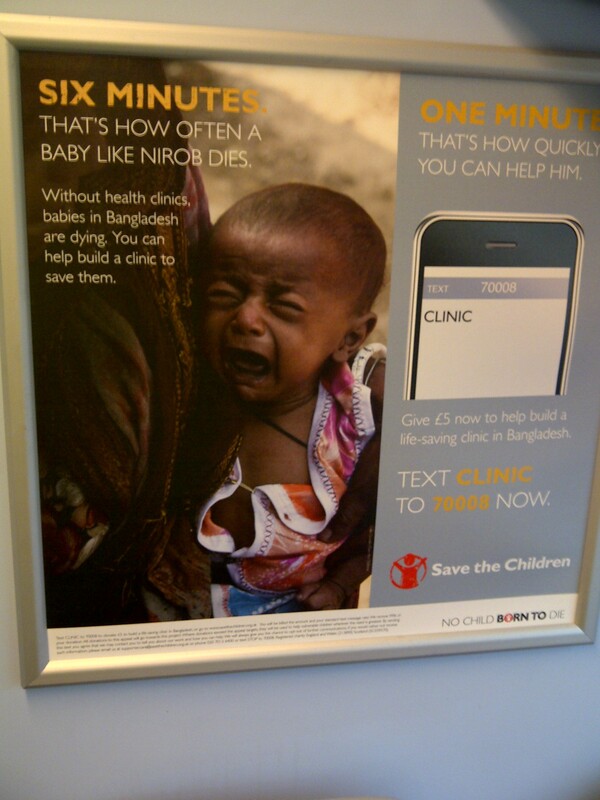 Finally: “You won’t see those dead or dying children in Unicef’s campaigns.” And that gets my third cheer. Let’s hope it stays true, unlike Save the Children’s shocking new poster campaign in the UK. It’s great to see more open debate about improving how aid agencies measure and report their performance. I agree – great piece in the FT. I searched online for the Save campaign following your post, and I too found it upsetting. I would be interested to know if any discussions took place internally about the extent to which the use of these pictures met the guidelines of the CONCORD Code of Conduct on the Use of Images and Messages. This stipulates that images should not sensationalise, and that the highest standards should be met in accordance with children’s rights as laid out in the Convention on the Rights of the Child. I am due to start a research study on the regulation of NGO advocacy in the autumn – a sphere where there is much less oversight than exists for humanitarian aid. Whether formal regulation would be appropriate or desirable is open to question – but at least initiatives like CORCORD can provide the NGO community with more frequent and meaningful opportunities to debate the ethics of such issues. I would be interested to hear your thoughts. recognise disaster victims as dignified humans, not hopeless objects. The picture I saw online was the one of the seemingly dead children on the ground. That’s even worse.